Men who sing in the stratosphere always hold a certain fascination over music fans, whether it’s the Bee Gees, Michael Jackson or countertenors. 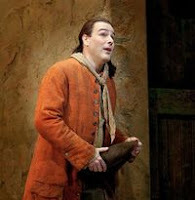 Here in New York, countertenors -- men who sing above the tenor range -- are having a banner season, being featured in two productions at the Metropolitan Opera: Handel's Rodelinda and the upcoming Baroque pastiche The Enchanted Island. Meanwhile, more countertenors are turning up in contemporary music (including new works by Thomas Ades and Peter Maxwell Davies), on recital series and in choruses alongside mezzo-sopranos and altos (often much to the latter's dismay). So what is it about the appeal of the high male voice? In this podcast Naomi Lewin asks three experts: Andreas Scholl, a countertenor who is currently appearing in Rodelinda at the Met; Brian Zeger; a pianist who is head of the Vocal Arts department at Juilliard and the Metropolitan Opera Lindemann Young Artist Development Program; and Chloe Veltman, the host and producer of VoiceBox, a radio program and podcast about the singing voice.